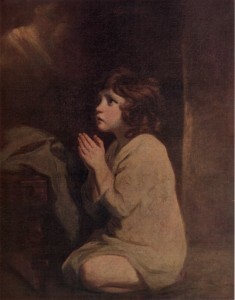 The Infant Samuel By Sir Joshua Reynolds. For more information and activities for this painting visit Garden of Praise. I knew I seen her before..just had to have her..though I have a print..can't take my eyes off of her....Wish I could pinpoint where I seen this From. I have a print of this painting that I inherited when I was 19, I am now 57 I have always loved it and keep it in a prominent place in my home. Hi' i have one oil too it looks like its very old its one oil. Where can i find a place to value the painting? I am curious. Has anyone found out the value of this and are they rare? As far as my search there is no other lithograph of Infant Samuel. This is what I call it a lithograph but, I was told it has brush stokes that was used with lithographs late or early 88th or 19 century. I see other people have asked but I don't see any responses. Is there any value to this painting? I have The Infant Samuel painting and another painting by Eugene Perry and would like to know. Steve, said lithograpph in l868 could not be a print.